The new BLAST Sit & Go is an exciting Sit & Go game where you could win big! 4 players are in for a fun surprise as they compete for a randomly drawn prize pool in a time-limited BLAST Sit & Go. 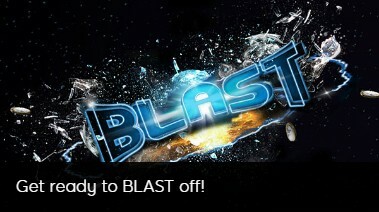 Every time you play a BLAST Sit and Go you could be playing for a prize pool of up to 10,000 times your buy-in! Once the game begins, the BLAST timer starts the countdown. When the BLAST timer runs out, the action takes over and all players automatically go all-in until there’s a single winner. The higher the prize pool multiplier – the longer the timer! Make your first deposit at 888poker and get 2 tickets to the twice-weekly $1,000 Depositors Free Tournaments. Get 2 tickets to the twice-weekly $1,000 Depositors Free Tournaments. Register to the next available tournaments and play for FREE. That's it! 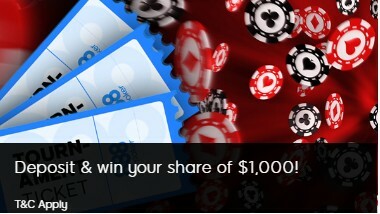 You'll be all set to play for a share of $2,000 – absolutely FREE. And there's more! Every week that you deposit at least once, you'll get 2 more tickets to the $1,000 Depositors Free Tournaments. So you can play for free again and again! 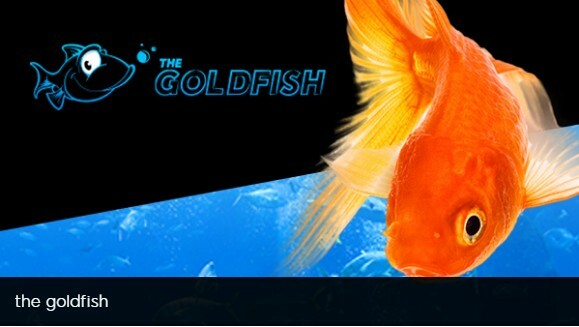 Play in any of the Goldfish Series for just $1 buy-in! Three different tournaments, three different speeds, three different times. Play in the one that’s right for you! If you're looking for big tournament action, look no further than The Whale, right at 888poker. This event is designed for players who are serious about their game and have something to prove. 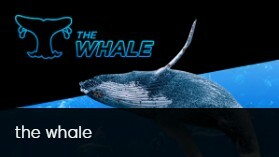 The Whale MTT is the perfect platform for you to showcase your poker skill and agility – whales are huge, but surprisingly agile. It's going to get wet and wild as all the big players come out to make a splash in this mega-money poker tournament with bags of money up for grabs! 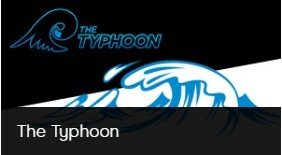 Are you ready to hang ten in The Typhoon? 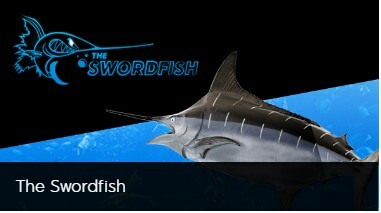 Find out with this action-packed tournament right here at 888poker! The Daily HighRoller Series features 9 awesome tournaments that run every day. Starting times begin during hours that are best suited to European, Pacific Rim and American players. 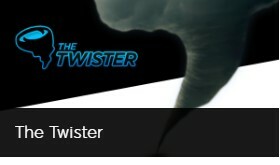 If you've got what it takes to withstand The Twister, then you deserve to win your share of what's up for grabs in this HighRoller Series Tournament. The Daily HighRoller Series covers 9 fantastic tournaments that run each and every day. Starting times begin during hours that are best suited to a wide range of players in 3 principal time zones; European, Pacific Rim and American. If you're looking for a thrilling turbo version of the Mega Deep Tournament, the $215 MTT Turbo it is! This exciting poker tournament is ideal for players looking for high-stakes multi-table action with a massive prize pool to boot. It's perfect for players with limited time to spare and who are looking for rapid-play action, but don't want to miss out on the big money! 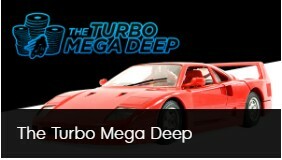 The blind levels increase quickly - every 6 minutes in the Turbo Mega Deep Tournament. But you still get to enjoy 10,000 starting chips along with the possibility of hitting that huge jackpot in just a couple of hours. 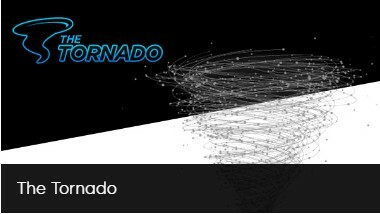 Twist your way to the final table in the tornado event of the HighRoller Series – the Tornado. This tourney is designed to give you the best online poker tournament experience around. Can you hear that thunder? 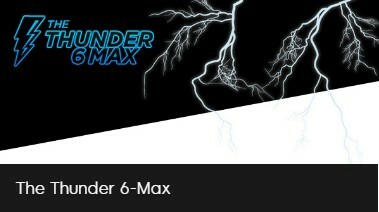 It's the sound of chips being pushed all-in during the Thunder 6-Max MTT at 888poker. This tourney literally thunders its way onto the tournament scene, intent on making every player sit up and take notice. As part of The Daily HighRoller Series, it fits perfectly into the middle with an affordable $55 buy-in and a $5K starting chip stack, that all poker players will appreciate. Also, the six-handed format of this event is guaranteed to deliver more action for those players who love playing lots of hands. And if all fails and you bust in the first 120 minutes, there's always that one second-chance rebuy to fall back on. 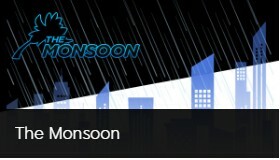 One of the most anticipated tournaments of The HighRoller Series is The Monsoon! It’s a torrential downpour of massive winnings with massive amounts of cash up for grabs every day at 5:30PM at 888poker! The Daily HighRoller Series is collection of 9 diverse tournaments that run every day. The Monsoon tournament features a starting stack of 5000 chips as well as a player-friendly 10 minute blind level structure. Playing in the rain has never been more fun – or rewarding!